aw china glaze, why you gotta do me so right? haha, i have to say that i am head over heels in love with this polish. strawberry fields is a rich vibrant pink filed with gallons of golden shimmer. it was released with china glaze's summer days collection '09. the entire set of paints were all pretty fun, personal favorites being watermelon rind, grape juice, this guy, and cherry pie. but they were all amazing. 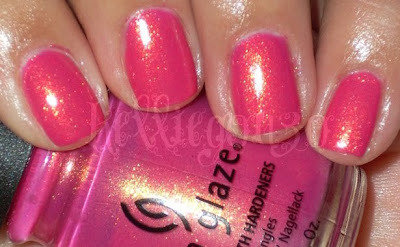 china glaze knows how to do their shimmers and glass flecks that is fo' sho!